Many of India's old traditions and cultures are being lost in the race to become part of the fast moving modern world. 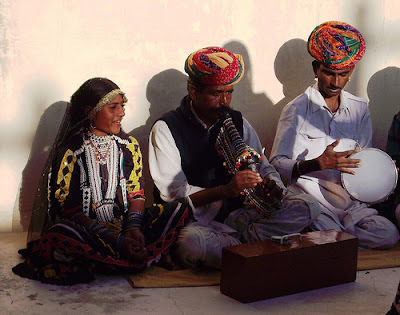 I watched this documentary today about the dying art of traditional Rajasthani music and how a small group of people are getting involved to save the music and the musicians, before they are lost forever. Highlights include snippets from Jodhpur RIFF 2011 (Rajasthan International Folk Festival), which attracts music lovers from all across the globe as well as famous music celebrities such as Mick Jagger. Well worth a watch - we even spotted a few artisans in the programme that we befriended whilst on my travels in Rajasthan! The next Jodhpur RIFF takes place between 26th - 30th October 2012. See images from this year's event here.